Inside a hostel in Ahuachapan, we relax with Mauricio Salavierra, some of his friends who run a beautiful restaurant called Tayua near Conception de Ataco and some brand-new friends from Quebec City who are in Ahauachapan for the same reason we are, to find amazing coffees. It’s late and dark and we are craving something slightly greasy and filling to eat after drinking quite a few Pilsners, so we order El Salvador’s national dish, Pupusas. The rest of the night is spent sharing food, beer and stories in Spanish, Quebec French and English. El Salvador is often maligned as a dangerous, violent country, one that North Americans often look over when choosing a Latin American destination, and it is true that El Salvador can be a dangerous place, the most violent in the Western Hemisphere. However, no country we’ve visited in the world shares the beautiful, untouched beauty of this tiny, dense nation. As a foreigner, it is very clear which areas are unsafe to visit, and these areas are largely within the capital of San Salvador, where gang activity is high. Like many countries in the Northern Triangle, a little common sense goes a long way in ensuing a safe and fulfilling trip. When travelling outside of the city to coffee growing towns such as Ahuachapan, Conception de Ataco and Juayua, the stunning beauty of the El Salvador landscape and remarkable hospitality and pride of the Salvadoreños is revealed. We’ve never felt more safe as travelers than when we are in these charming towns. El Salvador remains fiercely loyal to the Bourbon coffee tree. Elsewhere in Latin America, farmers are avoiding specialty trees and have chosen to reduce their crop diversity to protect against the monstrous Roya, a crop disease that has cut through Latin America and has repeatedly devastated coffee farms. A particularly terrible outbreak of Roya in 2014 is still being felt in El Salvador and it isn’t uncommon to see old farms which have been completely abandoned. El Salvador’s response to this crop disease has been very different from other countries within Latin America, they have been pivoting very hard into the specialty coffee sector. The Salvadoran Coffee Council predicts that 80% of Salvadoran coffee exports will be within the specialty coffee sector by 2025. For farmers such as Mauricio Salavierra, this means a very high level of risk. The danger of a massive roya outbreak on one of his farms is always looming. By carefully grooming his farm and applying fertilizer and fungicide, he manages to stave off the disease, but he must remain constantly vigilant to combat roya. Because farmers such as Mauricio have chosen to farm Bourbon and other exotic varieties of coffee, the flavours we have encountered from this country have been exceptional. 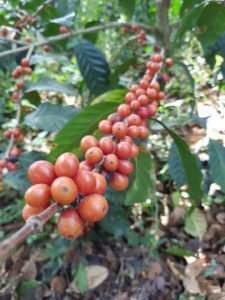 As other countries pivot to roya-resistant strains such as Catuai, Catimor and Castillo, the coffee flavor in these places has become somewhat homogenized in recent years. 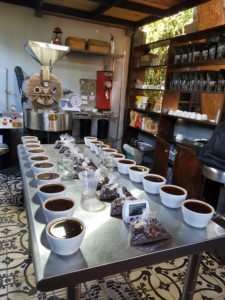 By contrast, the coffees we have been tasting from El Salvador have been marked with massive sweetness, explosive fruit flavors and dazzling acidity. Mauricio’s coffees in recent years have been some of the most inspiring and remarkable coffees we have ever tasted. These coffees have been a true expression of the passion, hard-work and pride of the Salvadoran people. El Salvador is a jewel of a country, one that we wish more Canadians would experience and enjoy. From the impressive volcanoes to the massive beaches, from the simplicity of the pupusa to the determination of the Salvadoreños. This is a beautiful country that we hope to return to year after year.